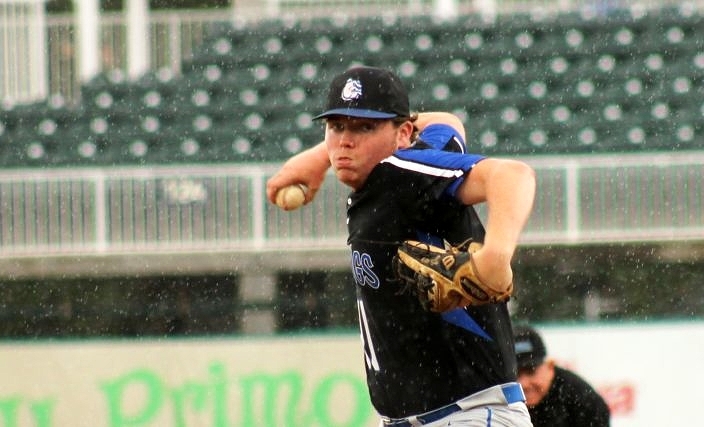 The Bulldogs Sam Brown delivers a pitch through pounding rain late in Saturday’s action. There are four teams competing in the state 2A Final Four bracket, and only one of them will dogpile at the end of the games. Although the Mount Dora Christian Bulldogs will not be that team after falling 13-5 to Wakulla Christian in Saturday’s semifinal at Hammond Stadium, there is still plenty of cause for celebration for the team. Over the past three years Bulldogs manager Ryan Abrams has guided the team out of the depths of the district cellar and nearly to the summit. Even after ending on the wrong side of a slugfest with the Saints, both players and coaches were left with pride in knowing what they had accomplished in such a short amount of time. Danny Carpenter helped the Bulldogs show that they belonged right away, as he scored to give them a 1-0 lead with their first swings in the top of the first inning. Carpenter was hit by a pitch, moved into scoring position thanks to a single to left field by Brighton Taylor and then scored off an RBI single off the bat of Scott Updike. Perhaps no other player cares as much about the program and where it has come than Carpenter. Saturday’s game was his final high school action of a seven-year career that began when he was a sixth-grader. The timing also uniquely allowed him to etch a special and unique mark in the team history. 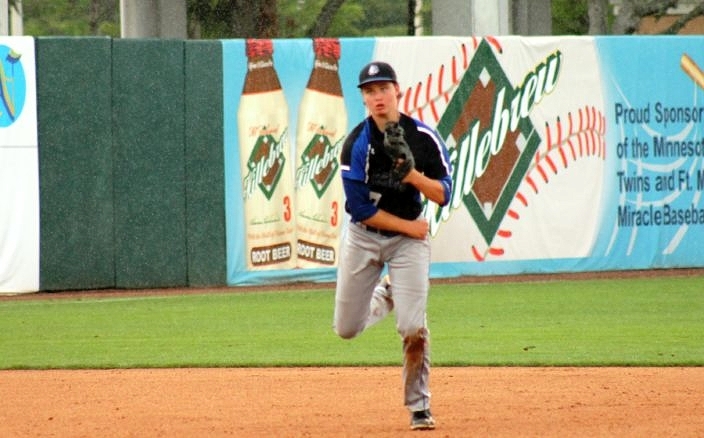 The Bulldogs began competing in varsity baseball when he was an eighth-grader, and he was part of the first team that learned about district competition and having a postseason to play for. Unfortunately, things were very tough on the team as they began to compete in the district playoffs. Bulldogs shortstop Brighton Taylor makes a throw across the diamond for a putout. After falling behind right away, the Saints (18-5) took the lead with their first swings. But the Bulldogs (18-10) answered back to tie things up in the second. Kevin Davina walked, Sebastian Rolon was hit by a pitch and Sam Brown singled to center to load up the bases. After Davina came in on a wild pitch, Danny Carpenter then delivered an RBI single to right to make it a 3-3 ball game. Three runs in the bottom of the second inning accounted for the deciding runs. Wakulla Christian added four more runs in the third to open a commanding lead, and finished things off with three more runs in the sixth. The Bulldogs had not played in the state Final Four since 1974, and in recent years there had not been a whole lot to celebrate. But after 30 combined wins in Abrams’ first two seasons, the team came together with purpose this year. Carpenter was just one of many guys that stepped up to lead the way, as he batted .533 in going 8-for-15 with four runs, four RBIs, a double and a home run during the Bulldogs’ playoff run this season.